The Land Rover Discovery has a long and illustrious history, dating back to 1989. 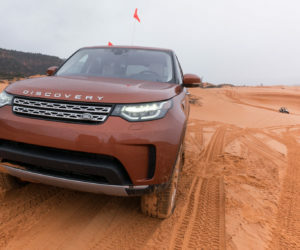 Throughout its nearly 30 year run, the Discovery has always been a rugged and spacious vehicle, though this time out, the Discovery has knocked it out of the park on all fronts, delivering on the brand’s promises of versatility and capability without exception, and wrapping it all in a modern, appealing, and luxurious package. I recently had the chance to spend a couple of days behind the wheel of the new 2017 Discovery, and wanted to share my experiences. It’s truly a special vehicle, and deserving of the highest of accolades. 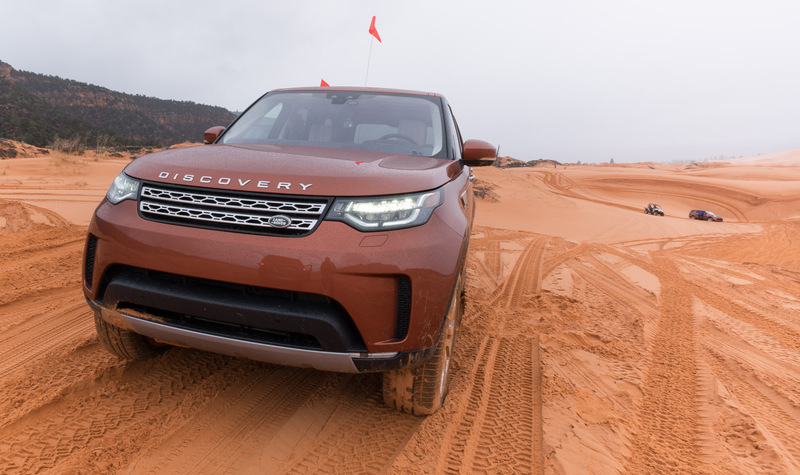 On first glance, the new Discovery is a decided departure from the boxy looks of the LR4 and its predecessors. 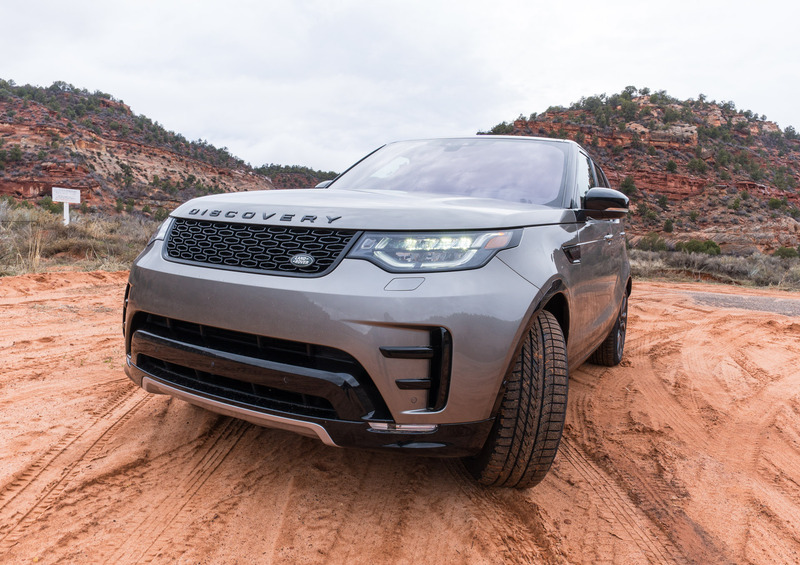 The new model benefits from the more angular and gently rounded corners which appear on the Evoque and the Discovery Sport, making it more modern, dynamic, and aerodynamic, while still managing to retain the height necessary for such a large passenger compartment. While the older Discovery designs had a rugged appeal, the new model definitely broadens its market potential. But the new model goes way beyond cosmetic changes, and is a complete ground-up redesign. For starters, it cut nearly 1,000 pounds in weight from the prior model, in large part thanks to the use of aluminum, magnesium and composite materials. This is immediately noticeable in terms of overall ride quality and performance. Here in the states, there are two engine options – a 3.0-liter 6-cylinder turbodiesel that makes 258 hp and 443 lb-ft. of torque, and a 3.0-liter 6-cylinder supercharged gas engine that produces 340 hp making 332 lb-ft. of torque. Both engines are mated to the outstanding ZF 8HP70 8-speed automatic transmission, which is also found in some of the world’s best sports cars. 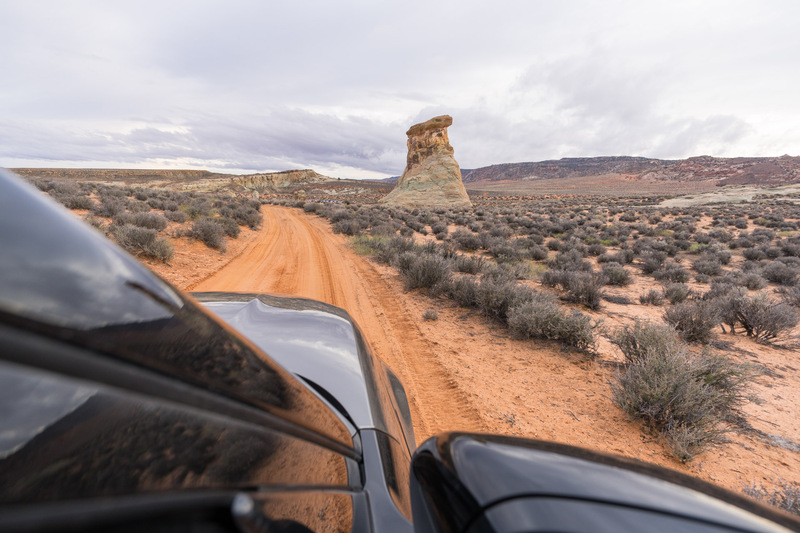 The gas engine is definitely zippier off the line, but the diesel offers better fuel efficiency, and great torque if you plan on spending lots of time off-road or hauling heavy loads. I found both engines to offer plenty of power, though I can’t speak to the smaller 4-cylinder engines which will be available in Europe. 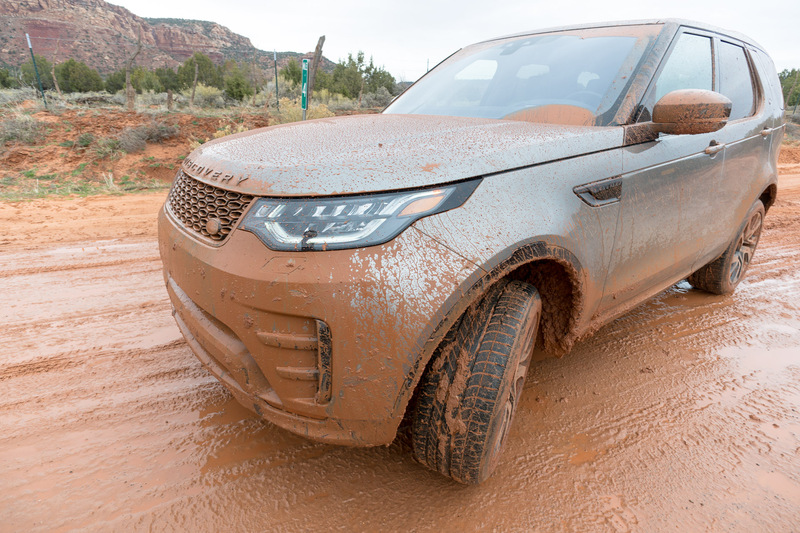 One of the great things about Land Rover vehicles is that they truly are built to go off road. It’s a true full-time four-wheel drive vehicle, and available with a two-speed transfer box for selecting low or high gear ranges. 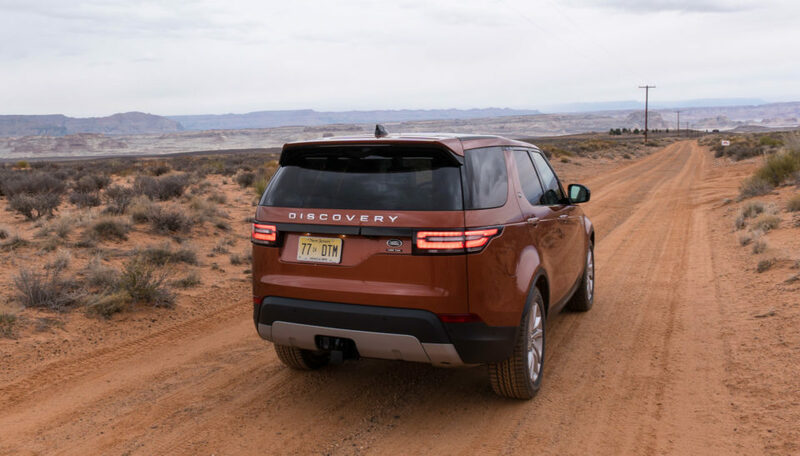 The new Discovery has some impressive stats for leaving the tarmac behind, including up to 11″ of ground clearance, 19.6″ of wheel articulation, a 34º approach angle, 30º departure angle, and 35.4″ of wading depth. It can ascend slopes up to 45º and side slopes up to 35º too. In other words, you can drive this thing over rocks, steep hills, and even through streams without worry. 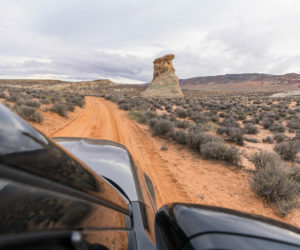 Throughout our drive, we did just that and more, as we drove through torrential rain, piles of loose sand, over treacherous rock formations, through mud puddles, and even a nasty snowstorm in the mountains of Utah. 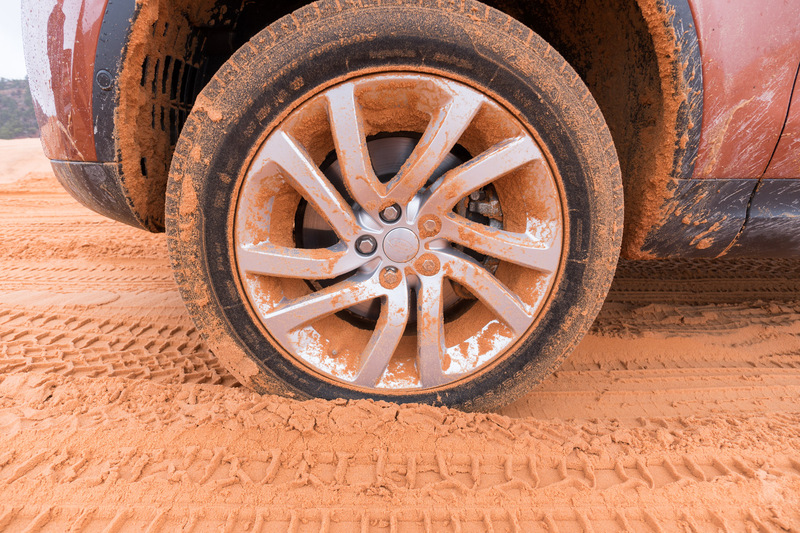 And we did all of this on stock Goodyear Eagle F1 all-season tires. 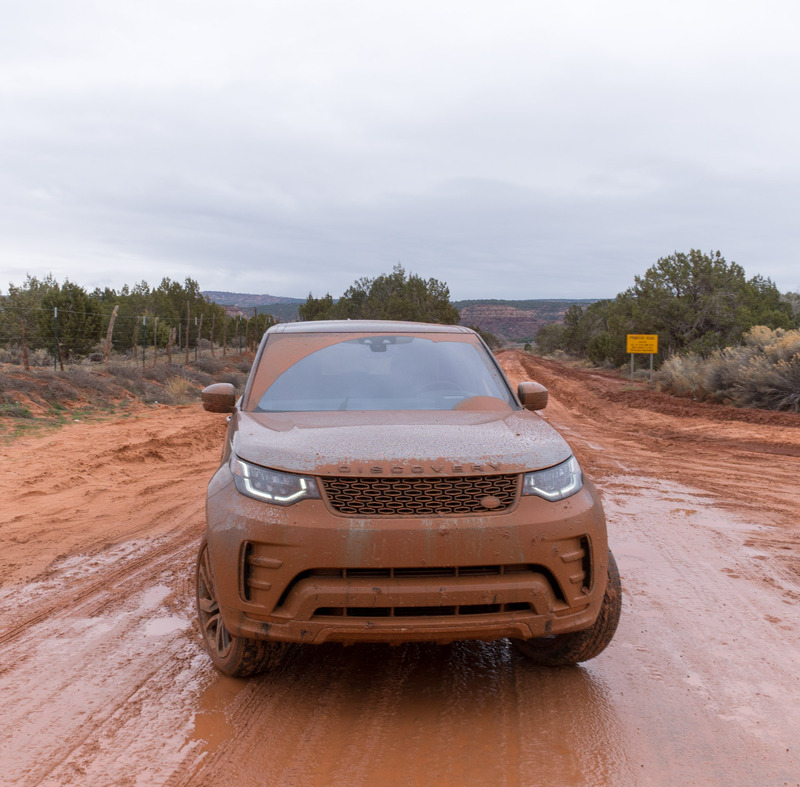 Along the way, the Discovery further proved its capabilities, as our lead support vehicle took on an unexpected challenge, and towed a jackknifed 18-wheeler out of the road like it was nothing. 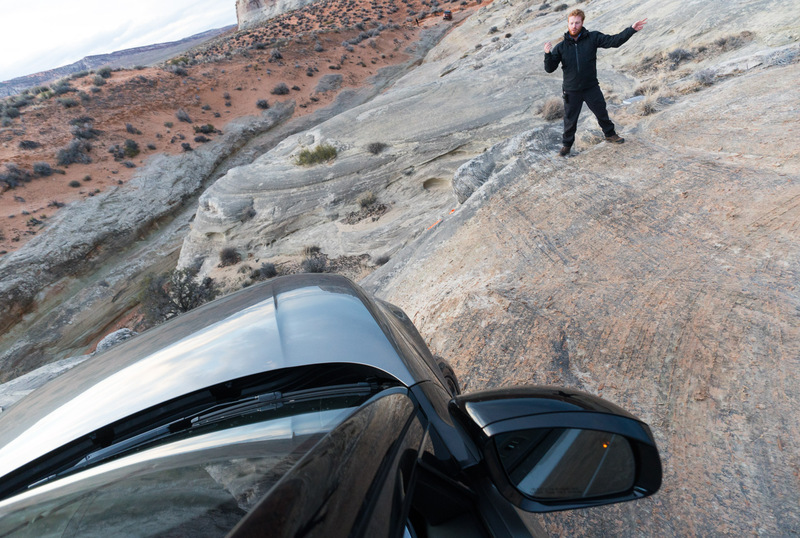 Speaking of towing, the V6 Discovery has an official towing capacity of up to 8,201 pounds. 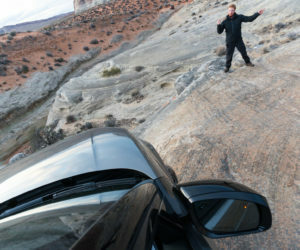 While it’s not available here in North America, European vehicles can be equipped with an optional electronically-deployed tow hitch, which tucks away neatly beneath the rear of the vehicle when not in use. An advanced towing assist package makes quick work of backing up trailers too. 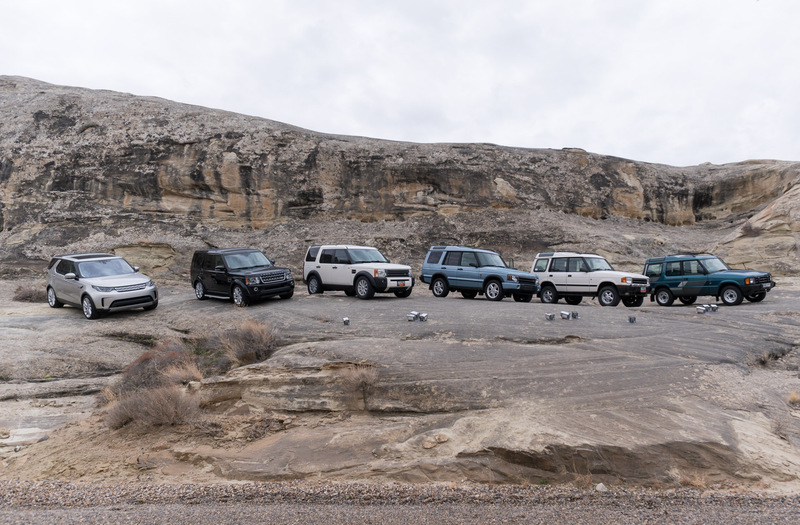 Both of the models I test drove included the optional Air Suspension package, which provides an exceptionally comfortable and smooth ride, while also allowing for increased ride high while off-roading, and lowering of the cabin for easy loading of passengers and pets. 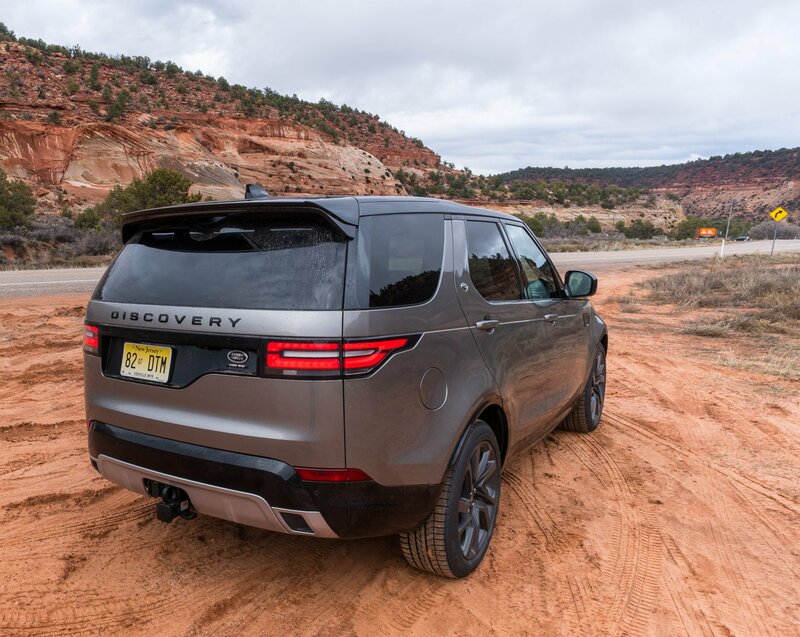 Despite its size, the new Discovery handles like a dream, in part thanks to its near perfect 50/50 weight balance, and much stiffer chassis than past generations. It feels planted, goes right where you want it to, and body roll is extremely well managed this time around. The electric power-assisted steering system is nicely balanced and neutral, without feeling too light or too heavy. Land Rover’s latest terrain management system works terrifically in the new Discovery as well, offering great confidence on any surface. 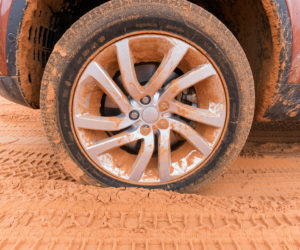 It can dynamically adapt to all kinds of terrain, distributing traction and torque appropriately based on road conditions. 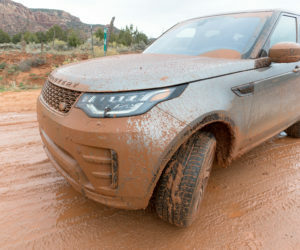 You can also override the automatic mode for specific scenarios, like driving across grass, gravel, sand, mud ruts, snow, or crawling up rocks. 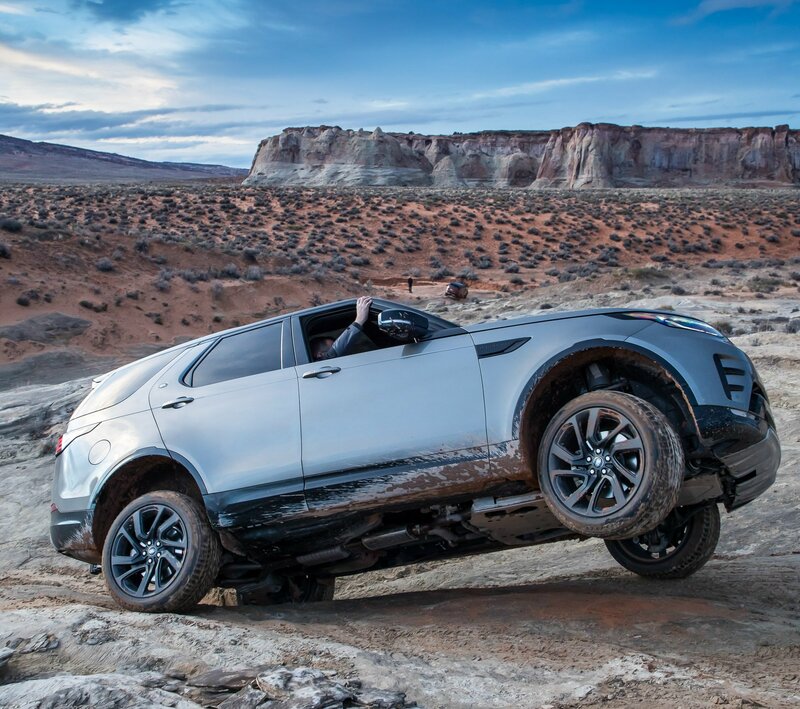 An All-Terrain Progress Control system can also be engaged, allowing you to focus on steering, while the car automatically manages throttle input and braking across rough terrain at speeds up to 19mph. 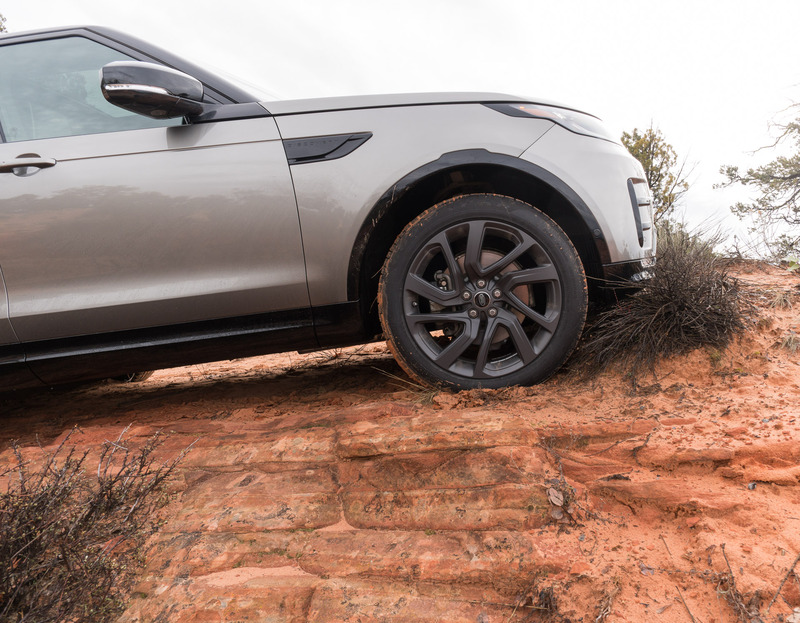 When off-road, you can also activate cameras which provide improved visibility of your surroundings, as well as diagrams which indicate wheel angle, suspension travel, differential status, and other telemetry. 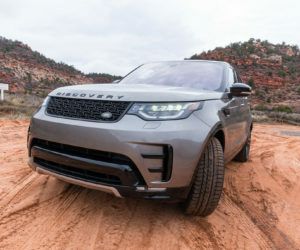 There are also numerous safety and convenience technologies available in the Discovery, from autonomous emergency braking with pedestrian detection, to blind spot monitors, parallel and perpendicular parking assist, lane-keep assist, traffic sign recognition, auto high-beams, and a 360º surround camera system. The adaptive cruise control system is top notch too, and is capable not only of coming to a complete stop in traffic, but resuming automatically. 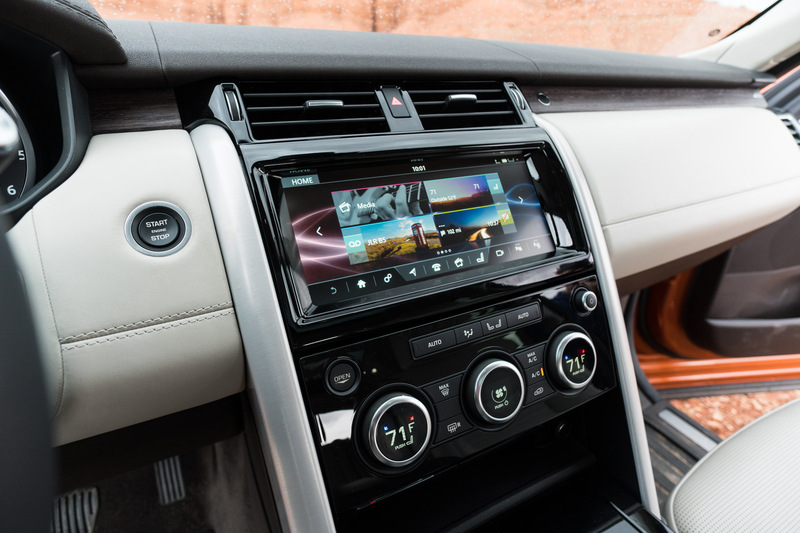 The latest iteration of Land Rover’s infotainment system, InControl Touch Pro is on board, running on a large 10″ display. This provides access to navigation, media, climate and other vehicle functions through a single unified interface, and I found it to generally be quite capable, though I found its use of icons instead of text sometimes made it hard to guess what a specific on-screen control might do, especially in the surround camera settings. If there’s any glaring omission from the infotainment system, it’s the lack of Apple CarPlay and Android Auto support, which is de rigueur these days. 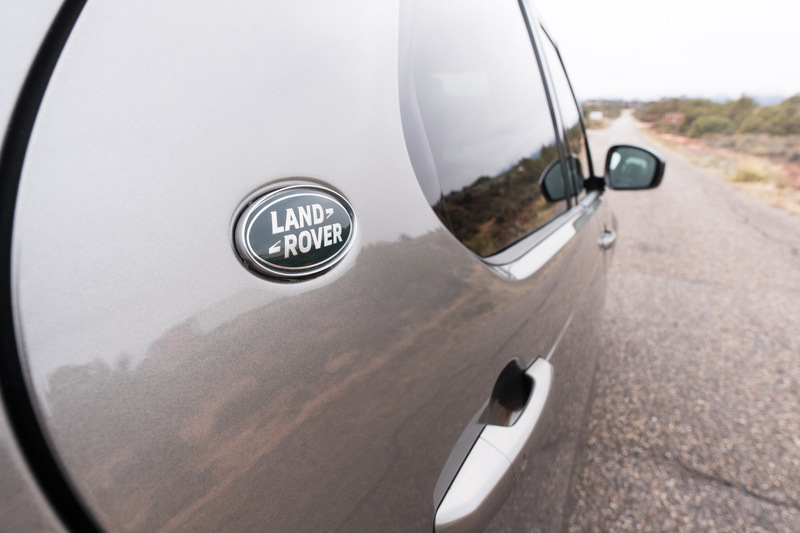 The Discovery’s impressive driving capabilities are truly only half the story. 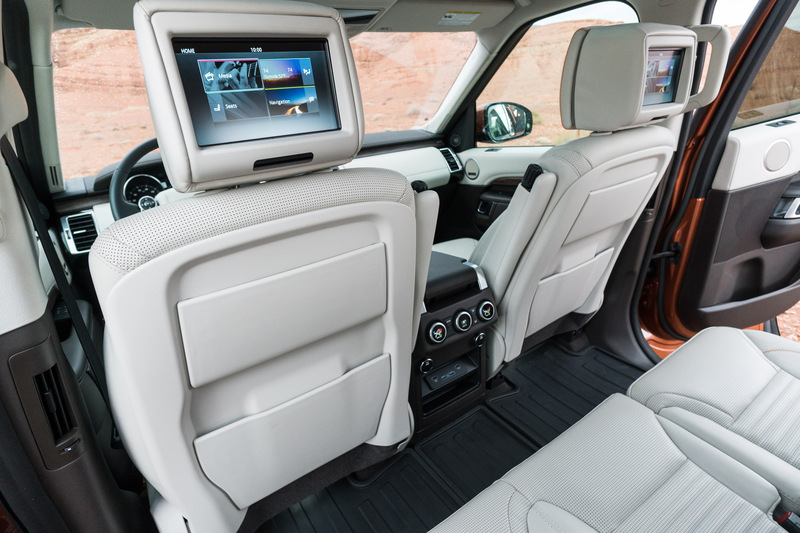 The interior of the Discovery is an exercise in elegant, modern design. Not only is the cabin beautifully styled, with clean lines across every surface, but the materials are all very high in quality, with soft touch surfaces everywhere, and excellent fit and finish. I particularly love the light contrast-stitched leather available in the more premium trim levels. 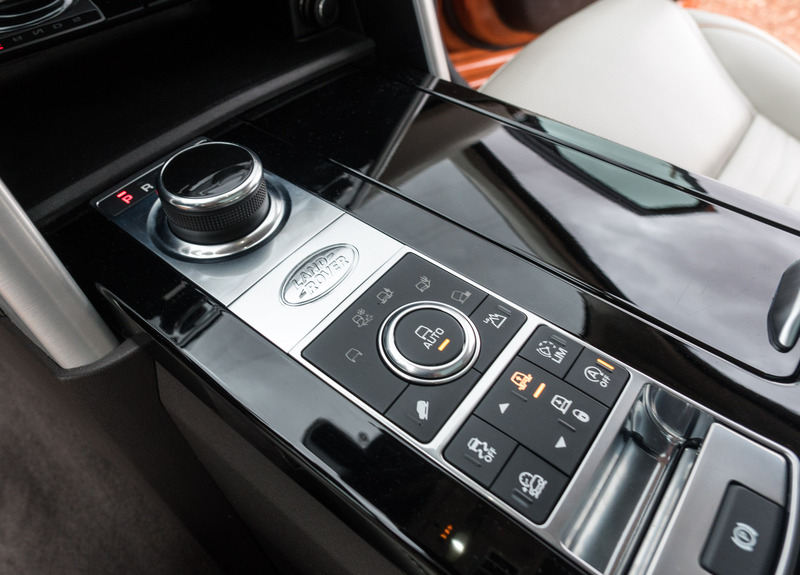 Heated seats are available for all passengers, with the option to go with cooling and massage functions up front as well. 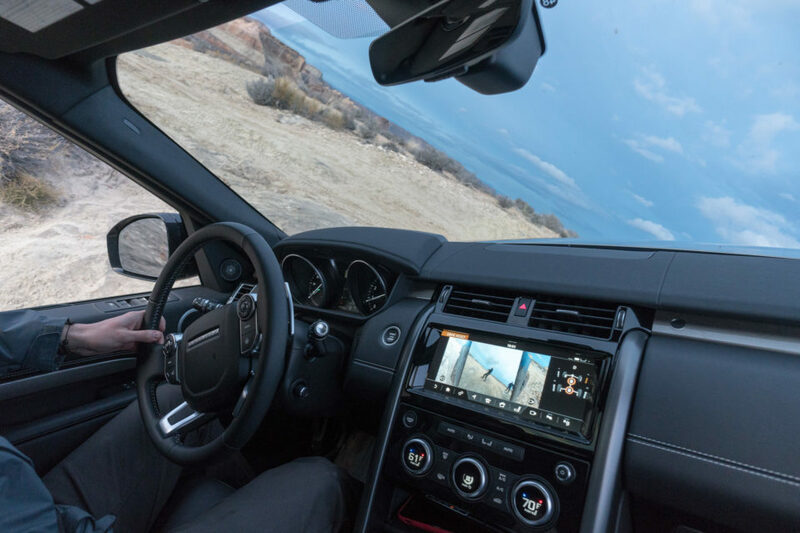 It’s also an extremely quiet cabin, sealing out all unwanted road and wind noise, and without the slightest squeak or rattle in either of the vehicles I tested. Even at highway speeds with a pair of semis riding at our sides, it was peaceful and quiet inside. The passenger compartment offers great comfort with well cushioned seats, and plentiful legroom and headroom throughout. 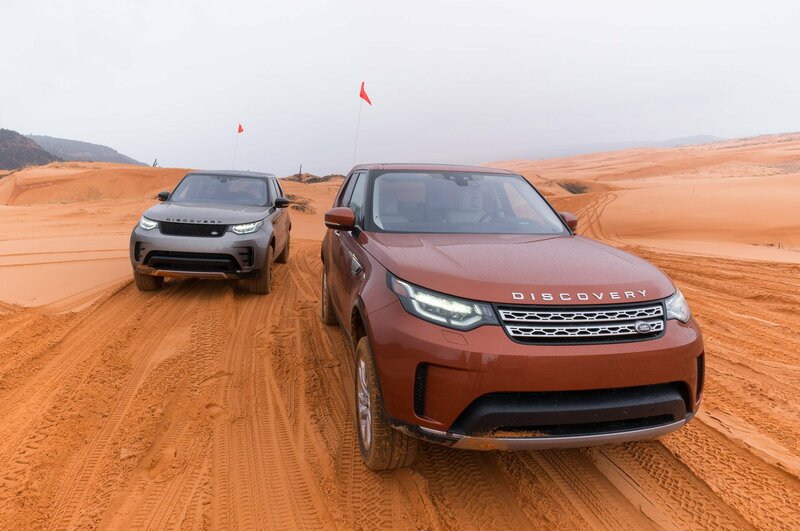 The Discovery can be purchased as either a 2-row (5-passenger) or 3-row (7-passenger), but thanks to some ingenious design, I see no reason to buy the 5 passenger model at all. 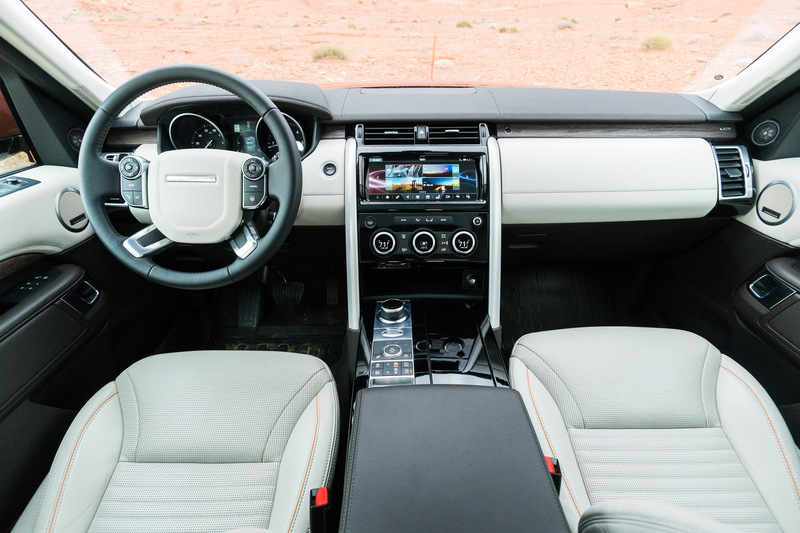 Somehow, Land Rover engineers managed to get both the second and third rows to fold completely flat, offering up a cavernous 82.7 cubic feet of cargo space with the seats folded down. 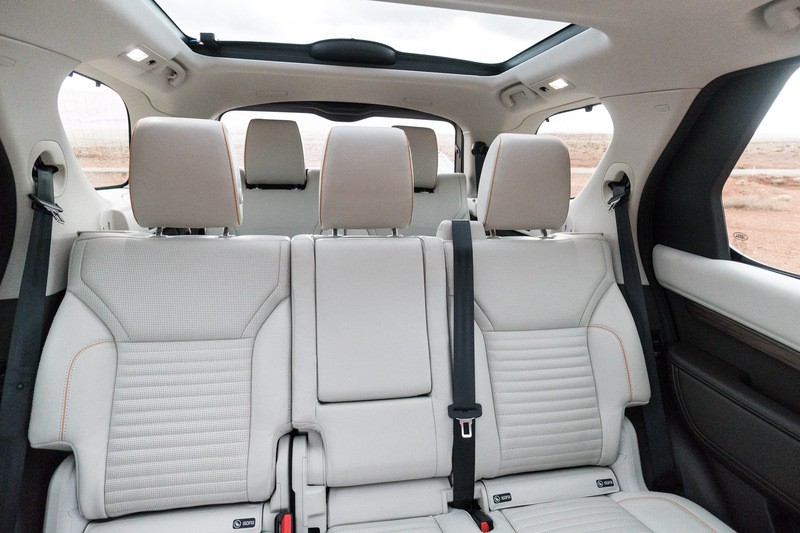 Unlike many other 7-seaters, there are no big obstructions when folding the seats down either. 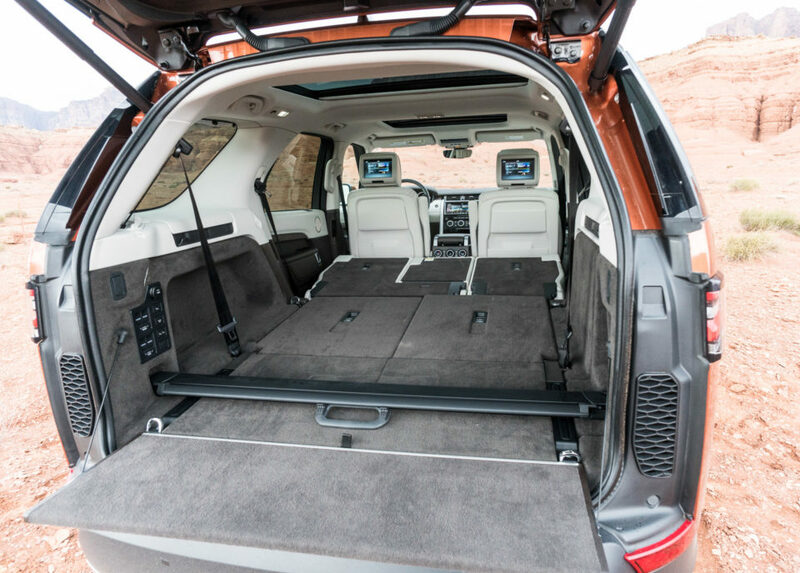 The power liftgate automatically opens with a wag of your foot under the tail of the SUV, and there’s also an optional powered inner tailgate which provides extra loading space, and a spot for up to three adults to sit and lace up their boots. Under the rear of the car, there’s even space for a full-sized spare tire – a rarity these days. The middle and rear rows of seats offer an intelligent power folding system which lets you arrange the seats into numerous different configurations, either via direct control buttons, through the center console touchscreen, or even via a mobile app. I won’t go over all the different ways you can configure the seats, but one of my favorites is to fold down the middle row and leave only the back row up, providing an awesome limo-like space with ridiculous legroom. Since each seat is equipped with load sensors, the seats can’t be accidently folded down with objects or people in them. There are also four seats equipped with child safety seat latch points, further increasing versatility. There’s also tons of storage all over the interior – with more than 20 different storage compartments throughout. I’m pretty sure I didn’t find all of them, but I especially love the hidden compartment that’s under the cupholders up front, which is big enough to hold four iPads! Once seated, passengers will be delighted with the Discovery’s impressive array of available modern conveniences. 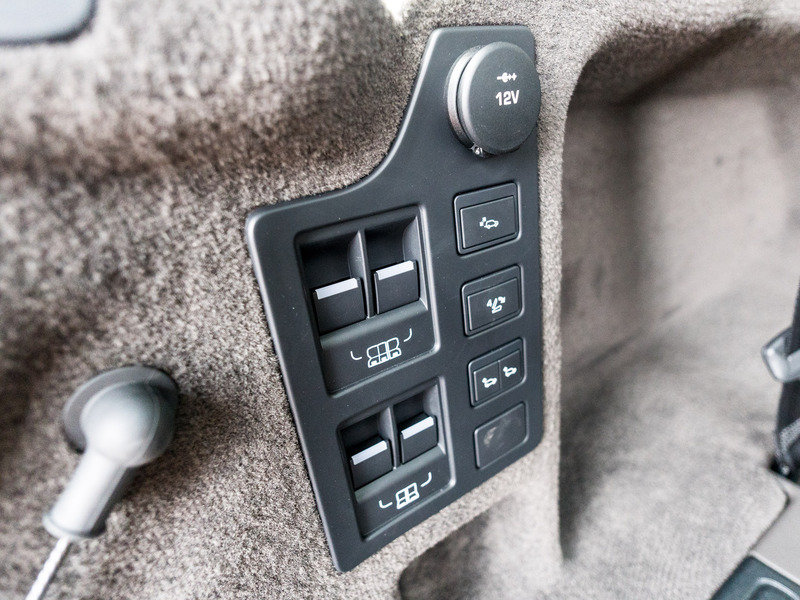 With up to nine smartly distributed USB charging ports and six 12 VDC charging ports, every single passenger in the car can keep their devices charged up. There’s also a powerful Wi-Fi hotspot which can provide connectivity to up to 8 devices. Middle seat passengers can view different content on seatback entertainment systems, and each seat has a secondary compartment up top that can store a tablet. With both rows in place, and the middle row set to its more forward position, there’s a surprising amount of legroom for all passengers. I’m 6 feet-tall and had no problem sitting in either row, though it does take just a little bit of contortion to get in and out of the third row because of its position behind the C pillar. Once you’re back there though, it’s cozy, and there’s an impressive amount of headroom. The dual moonroofs help give the whole cabin a great sense of openness too. I’ll go on record and say this now. The 2017 Land Rover Discovery is the best all-around SUV I’ve ever driven. It’s insanely versatile, capable, comfortable, and packed with the latest technology. With prices starting at less than $50,000, it’s also a tremendous value for what you get. If you have a family, and have any inkling to travel the great outdoors, you need to test drive this SUV when it hits dealers. 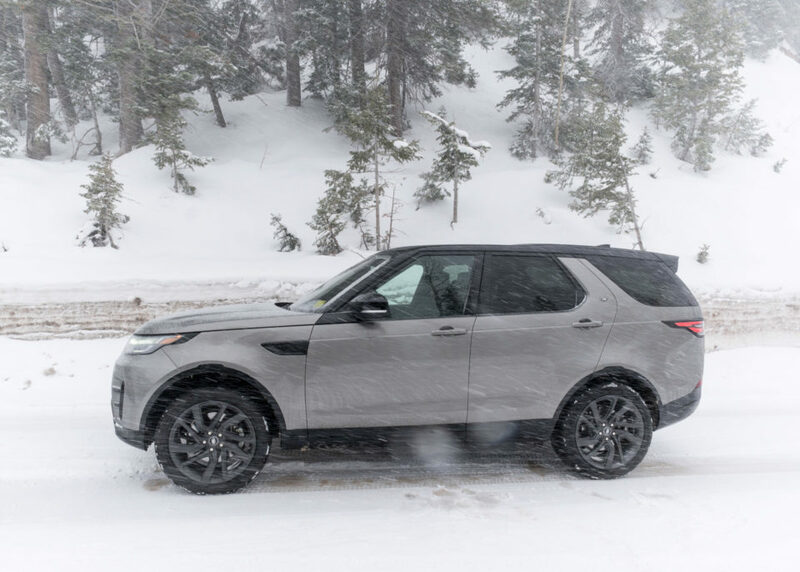 Here in the States, Land Rover will offer the new Discovery in four trim levels to start – the SE starts at $49,990 and includes 19″ wheels, a fixed panoramic glass sunroof, halogen lights, standard coil spring suspension, seating for five, and a standard supercharged V6 gas engine. 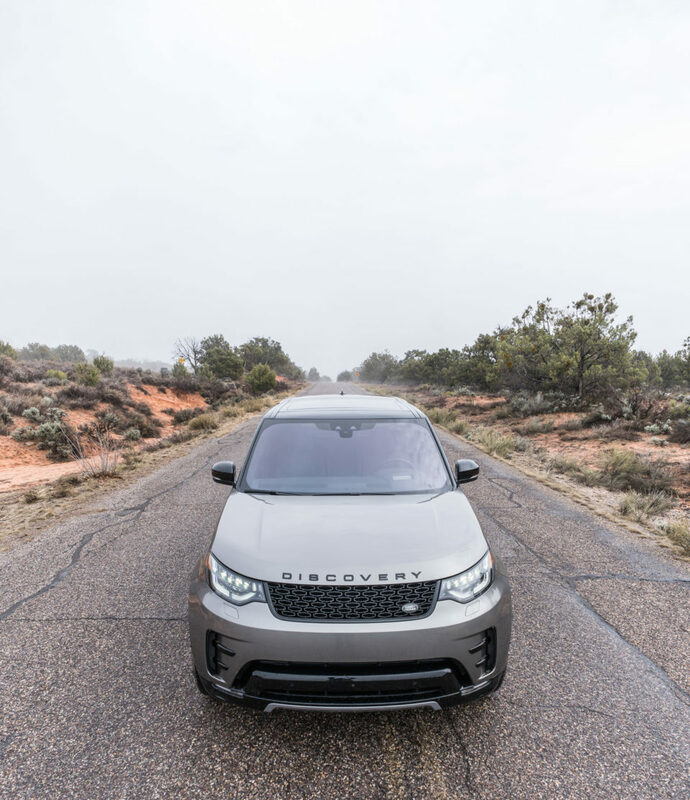 The Discovery HSE starts at $56,950 and gets 20″ wheels, and upgraded 380-watt Meridian audio system, LED headlights and fog lights, InControl navigation, a power adjustable steering column, and the option of the turbodiesel V6. The HSE Luxury gains an 825-watt Meridian audio system, standard air suspension, seating for seven, and the two-speed transfer case. 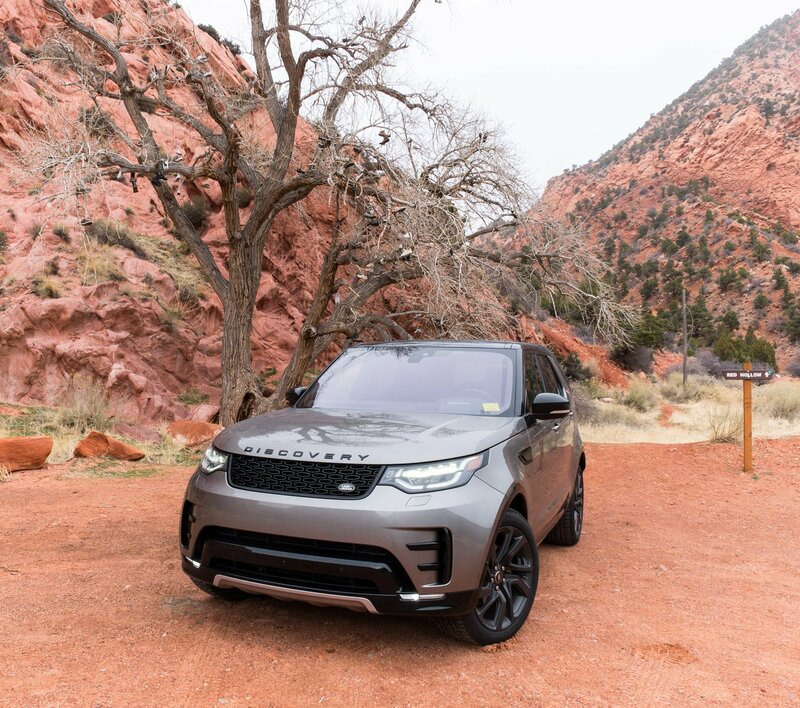 Those really looking for something special might consider the Discovery First Edition, which starts at $73,950, which adds 21″ wheels, premium metallic paint, a cooler compartment in the center console, and special badging among other features. Personally, I’d go for the HSE Luxury, which has pretty much all the bells and whistles I’d want.